William Shatner Wants a Star Trek Musical. Please Make It So! There’s one place that Star Trek has never gone before—musical theater. 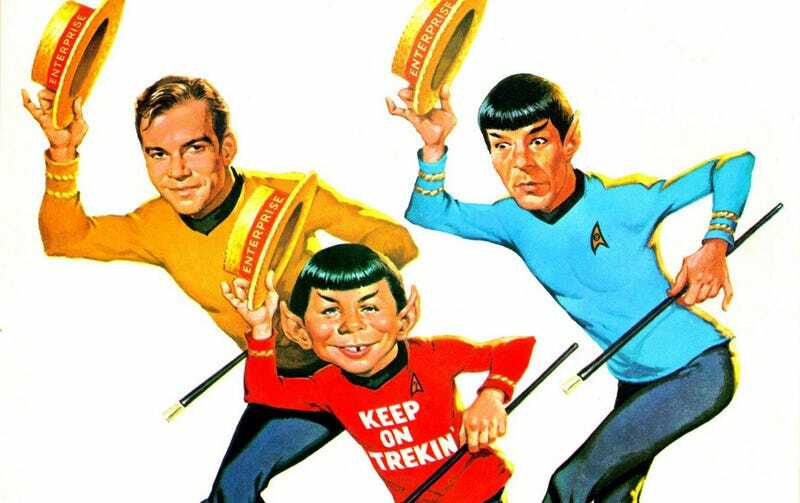 And William Shatner thinks that for its 50th anniversary, Trek should burst into song. What sort of musical numbers would you want to see in Star Trek: The Musical? I’m sort of leaning towards some kind of chorus line of dead red-shirts, singing about all the ways they were killed. Or a big aria about how “Risk is Our Business,” with perhaps a whole section about asking for a tall ship and a star to sail her by. Plus of course the obligatory Spock “grappling with human emotions” chorus. I’m attempting to sell a 50th anniversary show, but so far I’ve had very little luck. Maybe because Paramount’s going to do their own – but I don’t know how they can do their own without me. I’ve never been contacted. I’ve been actively trying to do a 50th anniversary show … We had a big company say: ‘What about a musical or a music variety show?’ That got some traction – but nothing’s come of it yet.